We absolutely love the creative process and we enjoy being challenged by our clients to create compelling content. 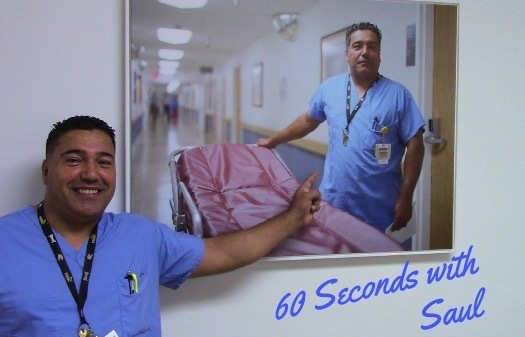 This video series spotlights the men and women who make Marina Del Rey Hospital so special, and its host, Saul, is someone beloved by all who know him. When we first met with the marketing team at Marina Hospital, they referred to their staff as a “cast of characters,” which we immediately embraced. The idea for “60 Seconds with Saul” came up early in our collaboration process and was pitched to Saul, who loved it. The time commitment for Saul is minimal and the client is thrilled with the results. If you are looking for interesting content to “humanize” your organization, we recommend you look within to identify the people who make a positive impact and explore ways to shine the spotlight on them. Need help creating content? That’s our jam! Contact us today. We are always coming up with social media tips and tricks for our clients, so we wanted to share some here on our blog. These are just a few suggestions to help build your following and engage your audience. Initiate connections. Add your social media handles to your email signature and business cards. By making it present in your communications, you will give others the opportunity to connect with you and network further. Tap into Trending Topics. Check out what’s trending on Twitter throughout the day because there just may be an opportunity for you to join the conversation and bring awareness to the organization. Update your Profile Often. Don’t shy away from updating your social media profiles. Add personality with topical thoughts, motivational quotes or give a shout out to your favorite sports team. People want to connect with people, so be sure your personality is as apparent as your professional resume. We all have someone special in our organization. You know, she is the glue that holds the business together or the “mother hen” who makes everything alright day after day? Highlighting this person with digital content not only reminds her why she is so beloved, it shows the world the human side of your business. Interview her about her job, ask how long she’s been there and why she loves it? Allow her to reflect on great and funny stories. Be sure to include a photo. Bonus points if you interview her on camera and share a video! Interview everyone else in the company about her. Ask the team to say why they think she is so unique. This would also make a great video. This one will also make her day. Invite her to guest blog on a particular topic. We work with a lot of non-profits and so we understand how helpful a PSA is for your organization and how much more powerful it is with a celebrity attached to it. Therefore, you should always be ready to film. We carry our Kodak Play Touch with us all the time in case an opportunity arises. If nothing else, a smart phone will always work in a pinch! Earlier this month, we were on site with Habitat for Humanity of Greater Los Angeles for their National Women Build event in Long Beach and Holly Robinson Peete was the spokesperson. So, as we were interviewing her for a long form video about the event, we seized the opportunity to capture a short video with her talking about why she supports Habitat for Humanity. A little bit of editing later and voila, a PSA! And P.S. Holly is awesome – we had some fun on Vine that day – you can watch it here. As a small business owner or entrepreneur, you’re not only the brains behind the operation, you’re also the brawn. Try this easy workout routine to flex your small-business muscles. Do some market research. Search Google for your business name, professional name, industry and local news. Make a list of 10 things you can respond to, add your expertise to, dispute or promote to your customers. Repeat on Facebook, Twitter and Pinterest if you’re so inclined. The more aware you are of how your customers behave online, the better your ability to reach them. Tip: Use Google Alerts to monitor this on a regular basis. Share your expertise. Take steps to respond and react to the 10 findings from Monday. Don’t forget to tap into the power of photos and videos as you go through your list. Tip: Always have a camera nearby—even if it’s your phone.